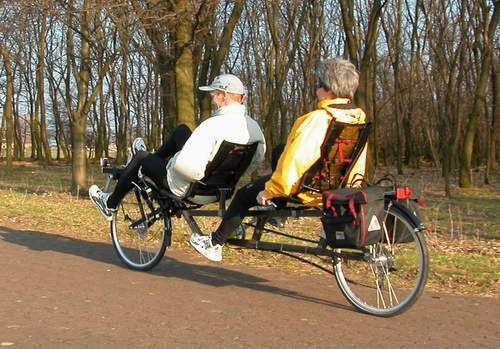 On this tandem, both riders drive their own wheel, and so they can choose their own gears. More information and pictures can be found on the builders' own site. 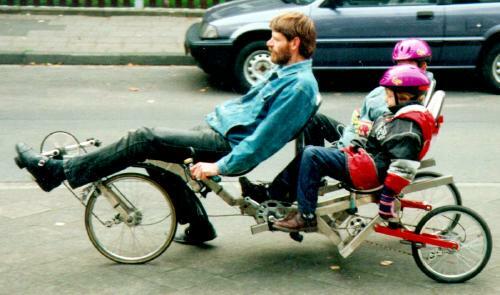 This tandem can be compared to the one of Uwe Anderseck, but on this one, the rear seat is also suitable for adults. 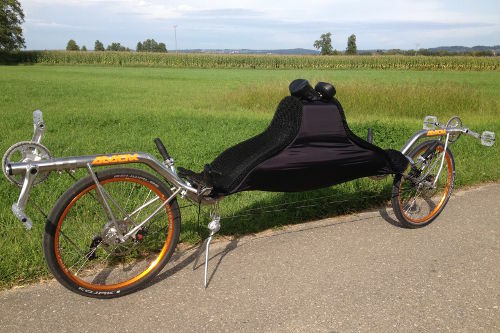 Uwe Schnell has connected his favourite bike (Flevoracer) and his wife's favourite bike to that nice Flevoracer-tandem: The FlevoLike. Thomas van Schaik had built this back-to-back tandem based on the frame of the FlevoRacer. Because the steering behaviour was disappointing, the tandem has been dismantled for the most part. Later, we could determine that on Flevo-tandems, the steering head must be more tilted forward than on solo Flevo's. The builders of the above tandems had done so. Maybe this racer will be reassembled with regards to the new insights. Interested? Feel free to contact the maker! Josef Kürten has built this special Flevo-tridem. He himself drives the front wheel; both his kids power the left rear wheel. All of them don't have to pedal because they have a freewheel. 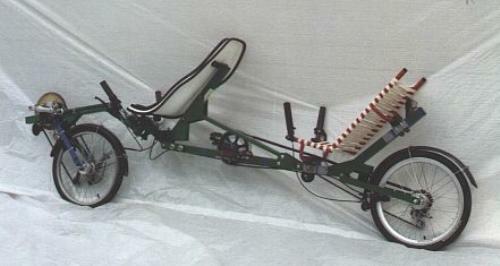 Moreover, the tridem has a fourfold suspension (1x in front, 1x like the normal Flevotrike has behind and the rear wheels each). The rear seats can be shifted over a tube in a wide range, so that they can be adapted to the growing of the children and even adults can ride on it. The bike is braked by a hydraulic brake in front and a braking system behind that is operated by only one brake lever. 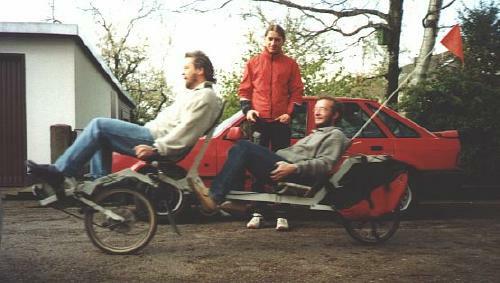 Just like Uwe Schnell, Steffen Kanon wanted to combine the advantages of the Flevobike with the joy of riding a tandem. The BTB concept together with a pivot steering could only be seen in Thomas van Schaik's failed trial, therefore Steffen decided to give it a next try. The better aerodynamics, the direct drive train and the same ergonomics for both riders are a plus of the BTB concept. Based on his good experiences when building his solo bike he built the tandem of stainless steel round tube, too. The construction with its single bent frame tube is remarkable: The frame is supported by a steel cable between the riders. The bike weights 28kg and can be converted quickly into a solo Flevo Racer of 18kg without using any tools. Even though the bike looks professionally made it could be built by any experienced maker with TIG welding equipment. There's much more information and a detailed set of drawings available from the maker directly. Please hover the mouse over the picture to see the solo bike.